I remember the morning that I found out that my Father had died. I was nine years old. I woke up to hear my oldest sister crying. My Mum and eldest sister Lisa were often arguing , so I went into her room and asked, “what are you two fighting about now? !” My Mum was sitting on the side of the bed comforting her and she looked at me and said, “we aren’t fighting today darling, something terrible happened last night, your father had a big heart attack and died!” She told me my Grandparents (my fathers parents) were at home and I ran downstairs to find them at the kitchen table with tears rolling down their cheeks. I ran into their arms as we all sobbed together. That day, many friends and family came over to see us. I witnessed countless adults crying and grieving. I remember one male family member hysterical and wailing. I stood back and thought, “this is too much, this is so painful. I will never show this much pain in front of other people because it is too much to burden people with this pain.” At that time, I remember making the decision that I would be strong and brave and grown up! This was a pivotal decision I made at this time. My mother was often incredibly worried about me because I did not show emotion. I remember she took me to see a counselor and I sat there in silence and vowed never to go back again. I did not want to wallow in the sadness. I remember having an early awareness that everyone has misfortunes to cope with and I would console myself that my life could be much worse and that I was incredibly fortunate in many ways. I was so young. I didn’t have the vocabulary to describe how I was feeling and I didn’t want to talk about the fear of no longer having a father. I wanted to support my Mother rather than add to her pain. I have often felt like this in relationships – be it friendships or romantic relationships – that other people are unable to support the weight of grief and unhappiness that lay within me. I found an entry in my diary where I recall the first time I was aware of being numb to my feelings. I was 14 years old and my Grandpa, my Mothers father passed away. I felt incredibly upset to hear my Mum crying, but I could not console her. And when I was told of my Grandfathers passing I was, again, emotionally blocked. Feeling emotionless made me negative towards myself. I built up strong walls and an ability to cope with a great deal on my own. People would often remark on my strength, but actually inside I was desperate to be hugged and loved and told everything would be okay. I used humor as a way of deflecting the sadness. I would lie to people that I had a Dad, just because I thought it would make life less uncomfortable for the people asking me questions. A lot of my peers at the ages of 9, 10, 11, & 12 years don’t know how to respond when you say your Dad’s dead. My Mum would console me with advice, which would mainly trigger me and ignite anger. All I craved was the space to be held for me, but no one had those tools. No one knew how to deal with an angry grieving teenager. So for many years, I composed myself and I journalled about my inner reality. It was my private space, my very own therapist was a pen and paper. I would scribble it all down and feel such relief from my spinning mind. At least I was processing in some way. However, I was missing out on learning the ability to confront things verbally, which I started working on in my late 20’s and continue to do so today. I have recently interviewed my sisters about their experience of the day we found out about our Father’s death and how they dealt with their grief. My sisters were 16 and 18 on that fateful day. We are all extremely fortunate to be best friends. Despite losing both of our parents (our Mum died 12 years after our Dad) we have never had big disputes about splitting up our parents belongings, family furniture or finances. In a sense, dealing with the very grown up business affairs, allowed us to stay in the practicality of life, which our Mother displayed to us after our Father’s death. 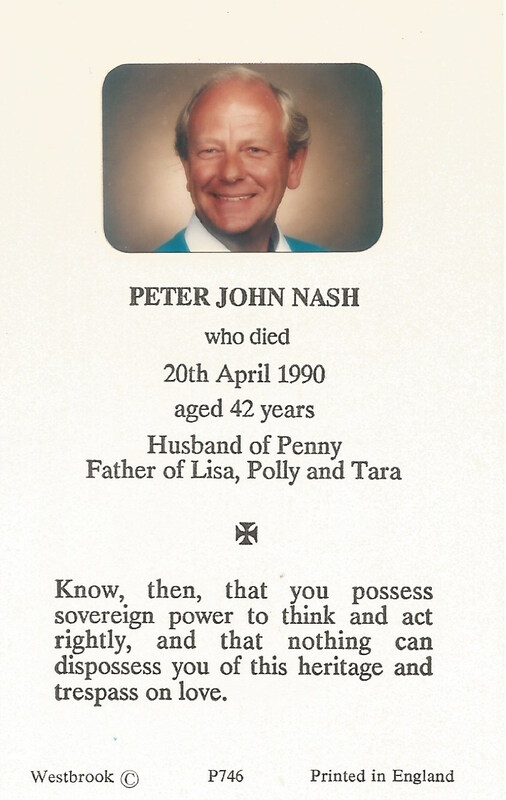 Last month, on April 20th, was the anniversary of our Dad’s death. In 26 years, I have never actually sat alone with my sisters individually, one-on-one, and asked them about that day that changed our lives. As part of my project, “Conversations About Death & Grieving,” I wanted to hear about their experience. I was so interested to hear about their last conversations with our Father. My eldest sister Lisa, had failed her driving test and our Dad was consoling her and saying, don’t give up. Just after he left the room, she remembers sitting on the edge of her bed thinking, wouldn’t it be strange if my Dad died? That very night, he died. My other sister Polly had had an argument with him and refused to kiss him goodbye as she left for school – a moment she wished had not been her last with him. I personally cannot remember my last moments I had with my Father. My personal memories of my Father are not as wide and far-reaching as I would like them to be as I only knew him for the short nine years of my life. I know that he was a kind and loving father, a good man with integrity, a generous heart and a fantastic sense of humor. Recently I listened to the brilliant Clara Amfo on BBC Radio 1 & 1Xtra Stories: In “Running with Grief,” Clara candidly talks about the recent death of her Father, her experience of grief and looks at the ways losing a parent impacts people’s lives. There were many touching moments during the documentary, but I particularly loved it when she said, ‘I really miss hugging my Dad.’ She compared his body to being like a memory foam mattress and how she could just nestle perfectly into his body. I loved this so much. A friend of her’s imparted advice shortly after her Dad died, and said, ‘you will never get over this.’ And its true, you never do. But with support and loving memories, life naturally goes on. I am amazed how much I still want to hold my emotions with my sisters. I still don’t want my outpouring of tears to worry them, or destabilize the atmosphere. Which is totally crazy because I know of course I don’t need to be like that. But that’s the way I’ve been hard wired for so long and it still takes me a bit of time to remember I no longer need the armor on. I have now started leading Grief Groups for adults, but as soon as I hear about the children in bereavement, my heart jumps and I well up with tears. I think a part of us can remain emotionally stuck at the age we experience early trauma. I certainly know there is still a nine year old girl very much alive in me that would love to be cuddled by her Dad today.